A temporary downturn in the Indian wind power market due to the transition from the Feed-in tariff based market to the Auction based market impacted the wind turbine manufacturing business of the company. Management expects this to normalize over Q4 FY2018 and thereafter. Consolidated Revenues witnessed a drop of 43% – impact of the fall in the wind turbine manufacturing business (consolidated numbers comprise of the chemical business, the wind turbine manufacturing business, which is separately listed as INOX Wind Limited, the wind farming business, which is a 100% subsidiary of Gujarat Fluorochemicals Limited and the film exhibition business, which is again separated listed company as INOX Leisure Limited). Company hopes to start receiving the supply of fluorspar (prices of which have shot up from $250 – $260 to $425 – $450) in the early part of November. The debt on wind farming projects i.e. outstanding of Rs. 125 Crores will be paid off from the milestone payments to be received from the sale to JP Morgan backed Leap Green Energy. Net Debt across company stands at Rs. 40 Crores for GFL, Rs. 1,260 Crores in INOX Wind, Rs. 125 Crores in INOX Renewables and Rs. 116 Crores in INOX Leisure. Total generation in the country grew by 4.5% during April to September 2017 [in absolute terms, the generation has increased from 581 billion units to 607 billion units] and during the same period, exchange volume in electricity segment has grown by 17% whereas the demand in the sector has increased by 4.5%, exchange transactions increased by 17%. In the month of July-September 2017 almost 90% of the days, the company had no congestion in the market thereby giving a comfort to the distribution companies that they can now buy power from the exchange whenever they want. September witnessed less supply of power and increase in the clearing prices. Avg. coal stock at the power stations, stood at 8 days against 21 days during the same period last year. Distribution companies purchase volume increased by almost 100%. Last year it stood at 7.6 billion units; while this time it stood at 15.1 billion units. Company was able to reduce expenses by almost 18.83% – mostly due to the purchase of technology by the company from 63 Moons. Company has not seen any new long term contracts being signed by distribution companies since under the long-term contract, the companies will have to pay the capacity charge even if they are not utilizing the capacity. Slowly this demand is moving to the short-term market which has enough liquidity. This will then increase IEX’s short-term transactions – which has recently seen a price revision. Open access volume last year was almost about 62% and distribution company buy was 38%, this year in the first six months it has changed and distribution company is 64% and open access consumer is 36%. More participation of distribution company is good for IEX because distribution companies are large buyers so if they are switching to exchange platform it is good for the company. 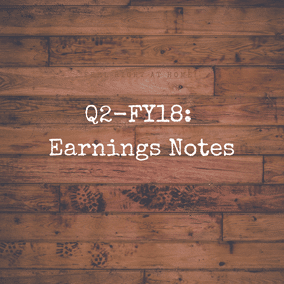 PVR Pictures revenue during the quarter was slightly lower as the company did not do any big films during this quarter. Company has during the first half of this year opened about 21 screens. Another 48 screens are lined up between 3Q and 4Q. Company is looking at a Q3 better than Q2 with a good film line-up. A few big films like Padmavati and Tiger Zinda Hai which are slated for December, Justice League coming up from Hollywood coupled with a lot of good regional content films in Tamil, Telugu, and Marathi. Ad revenue – company is looking at a range of about 15% to 18% growth for the next two years. On the newly initiated customer loyalty program – the company is looking to keep it very simple i.e. sending the customers coupons, which can be redeemed. The idea being is that there is a discount sitting on the customer’s mobile, which is waiting to get burnt and the only the customer can burn it is when he gets to a PVR and either buys a ticket or gets something to eat. The whole focus is to see if this spring board called privilege can get consumers to come one extra time, eat one extra item. On PXL – a new format i.e. PVR Extra Large – it costs a third of IMAX screen and in terms of payback raising about 2.5-3 years with the kind of payback (based on ticket price) i.e. Rs 25 to 50 premium on PXL across all the suites of the PXL auditorium. Company is looking to roll out about 11 screens in next 18-odd months. On GST – company has re-priced tickets that were priced between Rs. 120 and Rs. 150 by reducing their prices i.e. to Rs. 118 thereby bringing the taxation on them to a lower 18% GST bracket (this made sense since because the net realization did not make a difference if you were paying a higher tax versus charging the customer more). Company also mentioned having not realized any benefits from shifting to GST i.e. maintaining status quo. Additionally, the average tax rate has marginally moved up on ticketing since the F&B tax realisation has moved up. There is no clarity on state tax holidays and exemptions and how they the company will get protected at the end of the GST regime. Company is in discussions with the government and other representing bodies on the 28% rate levied for cinema tickets – an exorbitant rate as per the industry as well. Shorter window (Doordarshan showed the film – Ek Prem Katha came on television quite soon after its theatrical release mainly because of the significance of the subject) along with piracy are the two important issues that exhibition business have been engaged with the content partners (almost all respectfully adhere to a minimum eight week or two months window). On Tamil Nadu – there is a restriction on number of shows on week day i.e. the company can schedule maximum four shows and on weekend which is Saturday and Sunday – a maximum of five shows. Order book stands at Rs. 153.3 million and the business trend continues to be largely dominated by the US. In the Life Sciences business – company is executing approximately about 85 clinical trials across various phases across the globe. These clinical trials have a healthy mix of different phases of trials, phase’s one through four. Company is looking at a capex of Rs. 150 Crores mainly towards expansion the Chennai facility, the Bangalore facility, the facility in Princeton and towards the expanding of the Bogota facility in Columbia.